It’s always a big risk when you go as a pair to a restaurant known to serve their dishes family style. But hey, I like to live dangerously scratch that, make it gluttonously – so my good friend Shane and I met up one night to visit Vivo out in the west end of the city. On a Sunday night around 6:30, the restaurant was decently full, but regardless of capacity we requested to be seated at the eating bar. 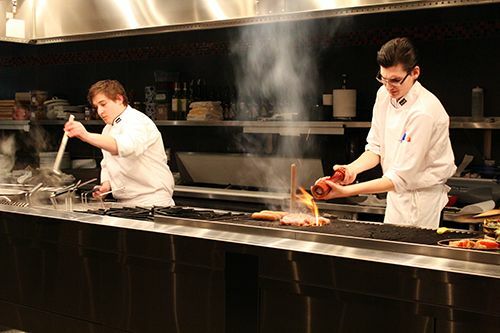 The bar gives you a bird’s eye view of the action in the kitchen – which I must say is a beauty! It’s a beautiful open space with sections dedicated to different dishes, and I really enjoyed seeing my food prepared from start to finish throughout the meal. 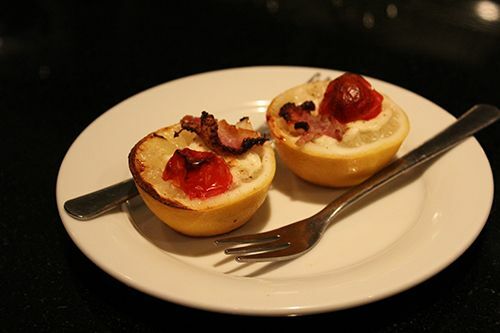 Guests at the eating bar are offered a quick taster before beginning the meal, and on this particular day we were served lemons stuffed with bufala mozzarella, a cherry tomato and a slice of meat which were then baked. The one quick bite was quite tangy, waking up our senses and heightening our appetites for the meal we ordered. 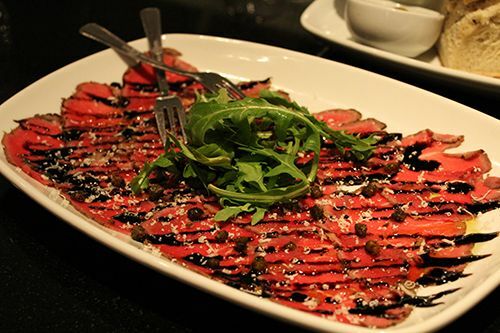 To start, we ordered the Carpaccio ($19): herb rubbed beef tenderloin, grana pedano, olive oil, balsamic reduction, fried capers and arugula. The beef was sliced ever so thin, served tender and easy to chew. Frying the capers was a great way to play up on textures, but I could have done with less balsamic, given that it made the dish quite sweet. 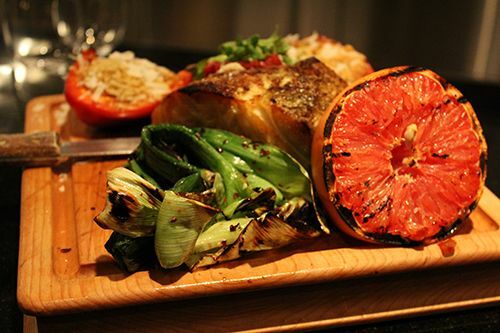 For our main, we skipped the predictable pastas and went straight for the Branzino ($80): baked Chilean sea bass, house made tomato relish, leeks and grilled pink grapefruit. With this main we ordered the Farcite Pepe ($12) on the side: red bell pepper, marash risotto, focaccia crumbs, parmigiano reggiano and grilled lime. What can I say about this dish? I loved it. The sea bass was cooked to perfection, where the meat was smooth and tender, flaking off with each bite. By itself, you could tell the fish was fresh, but I really enjoyed pairing it together with the tangy, savoury tomato relish, and a big squeeze of grapefruit juice on top didn’t hurt either. The dish itself could’ve done without the leeks, as we actually didn’t touch them at all, and we didn’t find it to add much to the presentation. But I want to tell you about those risotto stuffed peppers because they were absolutely delicious! The pepper with some residual crunch was filled with a creamy risotto with a kick of heat – seasoned wonderfully and a great counterpart to the fresh fish. Thinking about it right now makes me want to eat it again, or try and recreate it at home with some marginal success. So yummy. 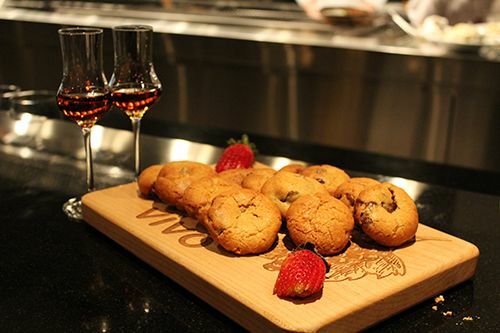 To end of this indulgent night, we were offered an off menu dessert: freshly baked cookies. Who can resist that?! Of course, theres the premise of having to wait at least 20 minutes, but that really isn't anything when you're having dinner with good company. For the evening, we were given fig, pear, and chocolate chip cookies straight from the oven. 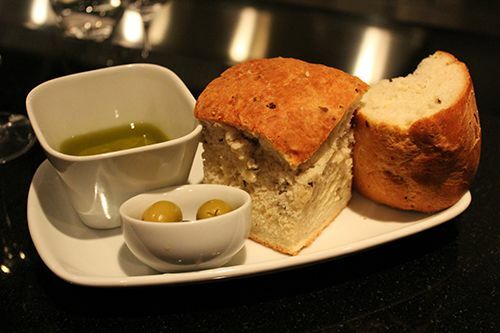 The crisp edges encompassed a soft centre, warm and delectable paired with a small glass of grappa. The fig cookies were our definite favourite, as the crunchy seeds of the sweet dried fruit stood out, but all the cookies were nice since they weren't too sweet. 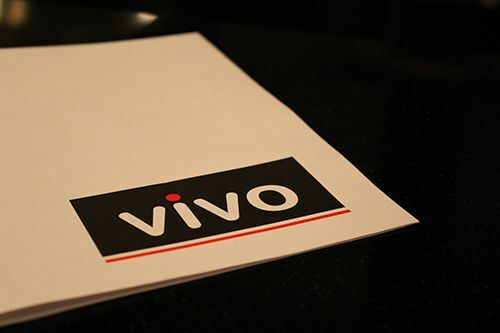 The dining experience at Vivo is definitely one to be remembered - there was lots of action to see going on in the kitchen, and our server was very knowledgeable and attentive to our needs. The portions are definitely catered towards larger groups, but there's no reason why you can't have half an order (they have prices to accommodate this). 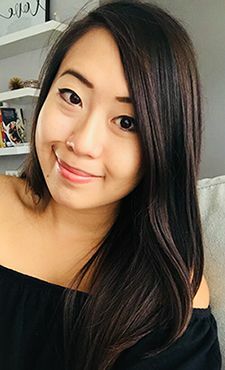 For larger groups and parties, Vivo is also able to put together a set party menu for $50 and up depending on the dishes you choose. So grab a few friends, or a large group for a celebration - sharing is caring here at this restaurant. Andrea everything sounds sooo delicious! I will have to try it out! Omg sweetie many all your posts make me hungry. This is such a good hang-out place with friends or family!! Thanks for this, Ms. Andrea! My god this looks AMAZING! I'm hungry just thinking about it again! the meals look beyond delish! Ooo, so many yummy things.. Oo.. Have a great friday. om mannnn your food photos drooooooooooooooooooooooool! seriously you make me wish i were canadian hahahahah! the food in canada is seriously insane!